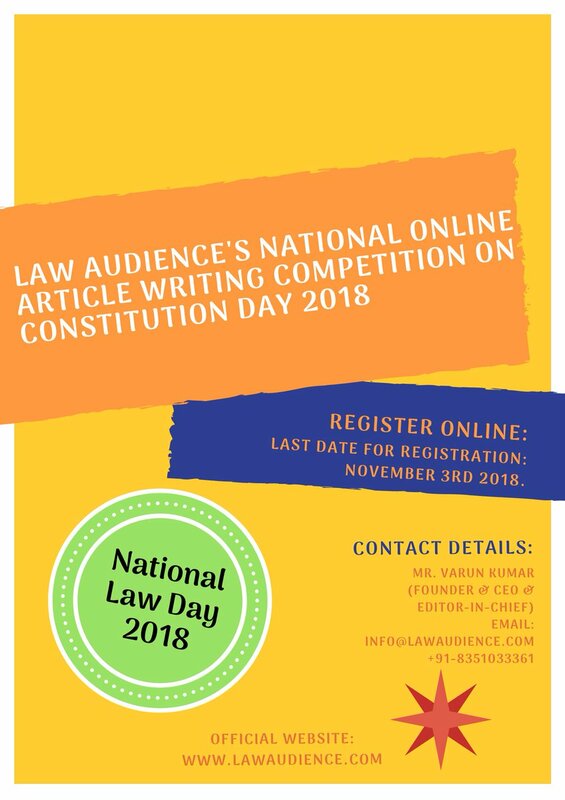 Law Audience presents its National Online Article Writing Competition on Constitution Day 2018. Constitution Day (National Law Day), also known as Samvidhan Divas, is celebrated in India on 26 November every year to commemorate the adoption of Constitution of India. On 26 November 1949, the Constituent Assembly of India adopted the Constitution of India, and it came into effect on 26 January 1950. The Government of India declared 26 November as Constitution Day on 19 November 2015 by a gazette notification. The ambition of this article writing competition is to make the people aware about the importance of Constitutional Law. Note: Feel free to create your own sub-themes. But, however, your sub-themes must be based on the above-mentioned main theme. ONLINE: (Credit Card/Debit Card/Net-banking/UPI/Wallets): CLICK HERE TO PAY THE REGISTRATION FEES ONLINE. All submissions must be sent as DOCX files through a Google form. Submissions submitted through any other mode other than Google form shall be disqualified. The title of the Soft Copy of the article must be in the following format: “Law Audience’s National Online Article Writing Competition On Constitution Day 2018”. Transfer or Pay the ‘Registration Fee’ carefully; Law Audience shall not be liable for any kind of mistake done by the participant at the time of transferring or paying the registration fee. Registration fee is not refundable at all costs. It will be refundable only in a case the competition is called off by the organizing committee due to any unavoidable circumstances. The competition can be called off by the organising committee at any time, even during the competition also. NOTE: While paying the Registration Fee online you have to enter your mobile number & email address. 1. Word limit – Minimum 2500 words & Maximum 10,000 words (Including foot notes). 10. All the write-ups must be plagiarism free (only 10 to 15% is allowed with proper footnoting). 11. All the write-ups must be original work of the Author(s) and must not be published anywhere else. NOTE: Don’t include your personal details (such as your name, phone number, email and other information of personal nature) anywhere in the soft copy of the article otherwise it’ll be disqualified. Decision of the jury shall be final and binding. Decision of the Organizing Committee shall be binding in interpretation of any rules or for any query or otherwise. NOTE: No individual mark sheet will be provided to the participants. A complete mark sheet of all the participants will be uploaded on the official website. No other document will be given or provided to the participants. There will be no answer sheet. Jury members will read or examine your submitted articles and will give the marks accordingly. 1st PRIZE: Certificate of Merit + Cash Prize of Rs 500 + Publication of the article on the official blog of Law Audience but not in the Law Audience Journal + Certificate of publication mentioning and recognizing that article has been published on the official blog. 2nd PRIZE: Certificate of Merit + Cash Prize of Rs 300 + Publication of the article on the official blog of Law Audience but not in the Law Audience Journal + Certificate of publication mentioning and recognizing that article has been published on the official blog. 3rd PRIZE: Certificate of Merit + Cash Prize of Rs 300 + Publication of the article on the official blog of Law Audience but not in the Law Audience Journal + Certificate of publication mentioning and recognizing that article has been published on the official blog. 4th PRIZE: Certificate of Merit + An Online Internship Opportunity + Publication of the article on the official blog of Law Audience but not in the Law Audience Journal + Certificate of publication mentioning and recognizing that article has been published on the official blog. 5th PRIZE: Certificate of Merit + An Online Internship Opportunity + Publication of the article on the official blog of Law Audience but not in the Law Audience Journal + Certificate of publication mentioning and recognizing that article has been published on the official blog. NOTE: Law Audience reserves the right to remove any of the above-mentioned prizes (In case, if we don’t receive suitable submissions). All the participants whose articles have been selected for publication on the official blog of Law Audience will have to sign an undertaking. Online internship is subjected to certain terms & conditions. The online internship will be unpaid. VARUN KUMAR, FOUNDER & CEO & EDITOR-IN-CHIEF.